Great for outdoors and indoors, kids can enjoy it all year round! Frame and Seat fold for easy storage. It can fold easy for storage. A full strap in seat belt with adjustable straps creates a safe place for your baby, to keep them snugly secure in place as they swing. Product dimension: 48.4'' * 51.9'' * 48.4'' . The adult supervision is recommended. Recommended age: 9-36 months. Please refer to the instruction when you install and use. Folding design for easy storage and travel. 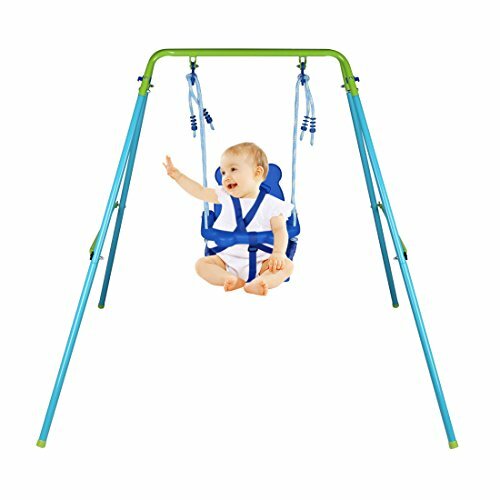 Ideal for encouraging toddlers to enjoy outdoor active play and for helping children learn to swing. Supports up to 55.1 lbs. Recommended age: 9-36 months.Frame included. If you have any questions about this product by HLC, contact us by completing and submitting the form below. If you are looking for a specif part number, please include it with your message.